EdgeSequel™ Paper Points Our paper points come, in all the standard sizes, from 15 to 80 in .04 taper. 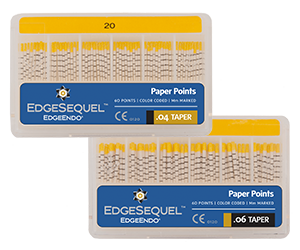 Our EdgeSequel™ paper points come in all the standard sizes, from 15 to 80 in .04 taper and are standard length 29mm +/-1. 60 points per box.